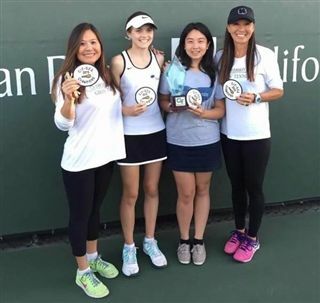 Coach Dawson Voted Girls Varsity Tennis "Coach of the Year"
Pacific Ridge Coach Jennifer Dawson was recently named California Interscholastic Federation (CIF) Girls Varsity Tennis Coach of the Year. The award, voted on by a group of league and CIF representatives, punctuates a memorable season for Firebird Girls Varsity Tennis. In October, the team won its first CIF Championship following an incredible playoff run and a perfect division record. Congratulations, Coach!